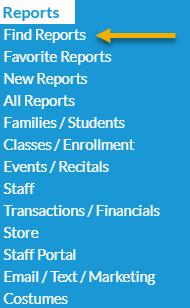 Find Reports from the Reports menu opens a Keyword Search. Keyword Match - The key word matches a tag that Jackrabbit Developers add to reports. Desc. (description) Match - The key word appears in the report description viewable when hovering over the report title. Title - The key word appears in the title of the report.